6 years after the first Foundations DVD... - here comes a new one, with all the important things I've learned in the last 6 years and all the new challenges the courses brought in last years! All new video material, many new topics, a bit different order and emphasis and tons of new challenges!!! The hardest part of this project was fitting all the info in 100min! Foundations Revisited DVD pretty much covers it all: from getting a puppy interested in playing with you, getting them to fetch, getting interest in static toy, building rock solid stays, restrains, warm ups and cool downs, all the steps towards tight turns, sends, independent pushes, threadles and serpentines, building a great come to hand, verbal discrimination, obstacle discrimination, tunnel sends, traps and turns (hard and soft turns), extension and collection, different crosses and handling, see-saw, weaves, tire, long, double and wall jump, how to choose sequences and adjust them to your dog, how to handle mistakes and more. The DVD is 100min long, plays everywhere in the world and can be shipped anywhere. It also includes a pdf file with all the sequences and maps. 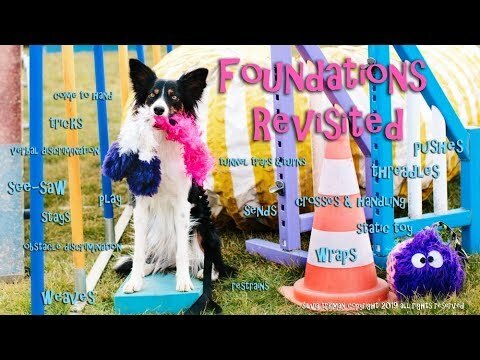 Topics of Foundations Fun DVD: turns, great distance, sends, speed, commitment, obstacle discrimination, come to hand, obstacle and handler focus, extension and collection, stays, serpentines, pushes and threadles, with tips on how to reward and how to put it all together into courses and take it to trials, while keeping it all fun fun fun. The DVD plays everywhere in the world and can be shipped anywhere -- OR, you can decide for the download version, save on shipping and have it on your computer in 1 to 2 hours after ordering. - DVD - OLD VERSION - for the new one, scroll up!!! - Download - OLD VERSION - for the new one, scroll up!!! You will get a link to a downloadable copy that takes about 1-2 hours to download, but the quality is somewhat lower as on a DVD. We recommend playing it with VLC or QuickTime player. You’re video reaffirmed that agility really is just a game! And you’re succeess proves that you dont have to be strict in your style to be successful at high levels. I’ve never finished an agility video before, boring! Yours I finished in one sitting late last night! Thank you for bringing my initial beliefs aboutvagility before I knew anything back, can’t wait to start your classes! Working on the tricks videos now!! Thank you for the feedback! I mostly give up on watching training videos as well as I can get bored easily, so I sure try to make mine as packed with information as possible to keep it interesting 🙂 And well, I was actually lucky that when I started agility, there were no instructors yet to tell us what to do and what not to do… So we were actually forced to just try and see what works. -- Hearing what you went through, I see we actually had a really good and easy start! Your Agility Foundations class has been highly recommended to me by a local agility trainer & I’m hoping to sign up for the September/October offering. Would you recommend going ahead & ordering the DVD early to become familiar with it? Or should we wait & just order it all at once? 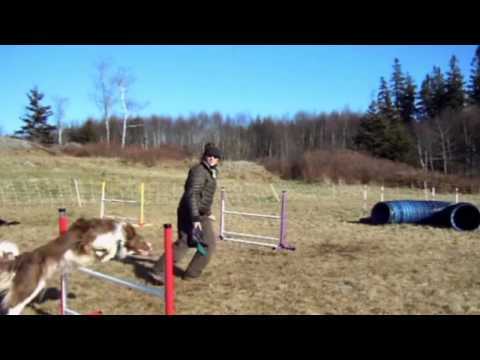 Both my young dog & are agility beginners. Thank you very much! I will check it out. I know the online class is designed for students of different levels, but is there a list of expectations or basic skills that students in the agility foundations class are assumed to already have? I’m still debating whether we’re ready to try it this fall or if we need to do more work on our own & aim for the spring class. We’re both enthusiastic & have some trick shaping & other teamwork games under our belt, but we’re complete novices in terms of agility. No, all you need is a dog who loves to play… -- But if he doesn’t, you can still join to work on that, as this class covers problems with motivation as well 🙂 You get a pre-homework list of skills from Puppy class to work on when registration opens. I really appreciate your feedback! A love to play we certainly have 🙂 I’m looking forward to checking out the DVD when it arrives. Thanks again for taking the time to reply. I purchased/downloaded the Agility Foundations video but did not get the course maps that go with it. I plan to register for the October class. Thanks. I’m so excited to get your newest training DVD. You have such joy in your dogs, and have so much fun with them -- -- it’s contagious and my dogs and I love it! Can’t wait to get started on your newest DVD. Thank you for all the fun!!! Hi Silvia, I just ordered the FF download and got it downloaded, but with audio only. I’ve tried it on Quicktime and on IMovie and both are the same. Any ideas on what went wrong? Yeah--got it to work using something called “Quick Look”. Strange, it works with Quicktime for me, but the “safest” is VLC -- it plays everything without a problem. Yes, it works. You should however download it using the free Downloader + app available in App store, otherwise it will be saved to the iPad. Not sure what you mean? I want it downloaded to my iPad? I’m not very technical. So, I need to download some app? What is the name of the app? Sorry, this isn’t making sense to me, LOL! OK, so I read the download instructions you have and I see you suggest the VLC app. So, I download that first, then download the DVD, but play it through VLC? For the iPad you need the Downloader + app (you install it from iPad through App store). The video should then play fine on the iPad, no special player needed. The VLC player I recommend if you play the video on a desktop/laptop computer. OK, I find a few different downloader apps, so I think I will just try one and see how it goes, LOL!~! Thanks!!! Oh dear, this may be beyond my technical know how. 🙁 The maps loaded, but now I have no idea where they are??? and I don’t think the DVD even tried to load? OK, I figured out how to save the maps, but the DVD did not load or even try. LOL! You should open the download link, that you received when purchasing the download, in the Downloader + app, and then choose download. You can also download the video to a computer and then transfer it to the iPad via iTunes. I just sent you the course maps via email. OH, I think it is working!!! 😀 I had to open the Downloader app FIRST and use it’s browser to then open your site. But, that did mean I had to pay again. So, it looks like it is loading now. I’ll let you know once it is finished if it worked. Oh, you didn’t need to buy it again, I could send you a new link 🙂 Anyway, just refunded you one copy. Let me know if you got it successfully. Wow, sorry that was such a challenge!!! Ugh!!! YES, I got it now!!!! Phew!!! 😀 Thanks for your patience! This was sure great fun to watch on my long plane ride home from Italy!!! Lots of new fun tunnel exercises for me to set up with Spur that we didn’t see in class, so I can’t wait to do that this week!!! Really great DVD!! Welcome back! And thanks, it’s my favourite DVD -- tons of fun games to play that teach them everything there is to know about agility! I bought the downloadable agility foundations dvd yesterday, but can not seem to access it from my computer -- it downloaded -- but I honestly don’t know where it’s downloaded as I can not locate it on my computer at all -- I do have the course plans though. Can you email me the link again? Sorry! It’s probably in your default download folder, but sure, no problem, I just sent you a new link. Right click the download button and choose “save as” so you can choose the folder you want it to download to.